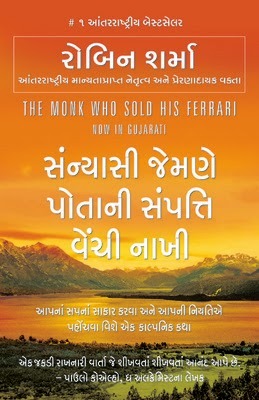 The Monk Who Sold His Ferrari (Gujarati) is the Gujarati edition of the bestselling self-help book about a high-flying lawyer’s journey of self discovery. The Monk Who Sold His Ferrari (Gujarat) is self-motivation and leadership consultant Robin Sharma’s best known book. The principles he intends to convey are in the form of a parable and this edition is in Gujarati. In The Monk Who Sold His Ferrari the story centers around a successful lawyer, Julian Mantle. It is narrated by John, Julians’ friend. To John, Julian Mantle is a role model, whose success and lifestyle become something that he himself aims for. Julian Mantle is a highly successful professional. His practice is flourishing, he has a mansion in an exclusive neighborhood inhabited by celebrities. He moves in the highest social circles. Julian seems to be enjoying life to the fullest. He has a summer retreat in a tropical island, a private jet, and a magnificent red Ferrari, which is his most prized possession. To achieve this position and wealth, Julian works day and night, with scant regard for his health. One day, he collapses in the courtroom, of a sudden heart attack. Suddenly, he seems aged and withdraws into himself, refusing to see anyone. Julian Mantle disappears, having sold everything he owns, including his Ferrari. For three years, no one hears from him and no one knows what happened to him. Life moves on, and now John is living Julian’s lifestyle. One day, Julian comes back and pays a visit to John. John is now a highly successful lawyer, but he has aged, while Julian looks surprisingly young and fit. He seems to have shed all signs of his age as well as ill health and seems to be completely at peace with himself. This is when Julian tells John the secret of his transformation from stressed out individual to a serene one and teaches him five simple rules for life. The Monk Who Sold His Ferrari is not a book about earning money and being materially successful in life. Readers learn how life can be a happy experience instead of being a burden that has to be endured. It teaches how to take care of the fundamental requisites of life, so that one can be happy irrespective of wealth or success. Robin Sharma is an Indian born author and leadership consultant. Other books by Sharma include Who Will Cry When You Die?, The Greatness Guide, The Leader Who Had No Title, and Mega Living From The Monk Who Sold His Ferrari: 30 Days To A Perfect Life. His books are about self-motivation and leadership skills. Sharma was born in India, but settled in Canada. He is a law graduate and worked for the Supreme Court of Nova Scotia. Sharma was a litigation lawyer, but he quit his practice to focus on writing and teaching leadership and self-development skills. He has authored fifteen books and has his own leadership training firm, Sharma Leadership International Inc., based in Toronto. Sharma is a highly sought after international consultant and speaker and is the recipient of the Golden Gavel Award given by Toastmasters International.